The American Express Reward Card is an ideal incentive for maximum choice to any prepaid card recipients! The Card is accepted virtually anywhere American Express® Cards are welcome. The funds on an American Express® Reward Card do not expire. A $3.00 monthly service fee will be assessed against the Card balance starting 7 months after Card issuance. 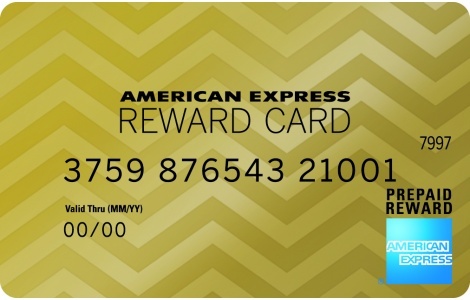 This American Express Reward Card can be used at U.S. merchants that accept American Express® Cards. Funds do not expire. No ATM cash withdrawal. Subject to applicable law, a $3.00 monthly fee will be assessed against card balance starting 7 months after card issuance. Additional limitations apply, including restriction on use at cruise lines or for recurring billing. See Cardholder Agreement for complete details. Card cannot be redeemed for cash, except where required by law. This Card is issued pursuant to a loyalty, reward or other promotional program. Card is issued by American Express Prepaid Card Management Corporation.